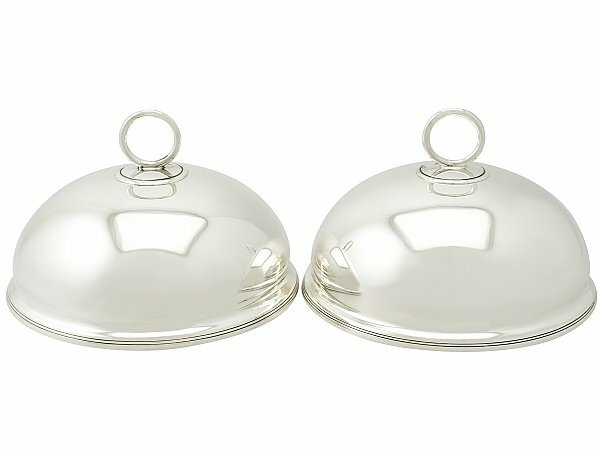 These fine antique Victorian sterling silver dish covers have a plain circular domed form. The surface of each fully hallmarked cover is plain and encircled with a band of tooled decoration to the rim. Each cover retains the original hallmarked detachable ring loop handle, securing with a hallmarked screw fitting. The interior of the covers bear the retailer’s mark ‘Lambert & Rawlings, Coventry St, London’. 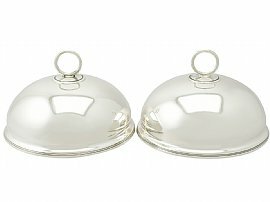 These antique dish covers are a very good gauge of silver, excellent quality and in excellent condition. Full hallmarks struck to the surface of each body and part hallmarks handles and screw fittings are all very clear.